Looking very much like the “invoices” sent out years ago by the heavily-fined (and, at various times, suspended by both ICANN and CIRA) so-called Domain Registry of Canada (also known as Internet Registry of Canada, Domain Registry of America, Domain Registry of Europe, NameJuice.com, Brandon Gray Internet Services Inc. and many more), the “not a bill” “domain name expiration notice” received by NinerNet Communications recently reminds us that some people only know how to do business dishonestly — or at the very least on the fringes of legality. Although it could have been copied, the notice received by us from “iDNS Canada” is almost identical to those of the Domain Registry of America sent out in previous years, and the maple leaf used in the iDNS Canada logo is indeed identical to that used by the Domain Registry of Canada in previous notices. Their website domain on their notice is idns.as, the dot-as country-code top-level domain (ccTLD) being registered to American Samoa, a south Pacific island nation. Trying to load the website at that address results in a redirection to idns.to, the dot-to ccTLD being registered to Tonga, another south Pacific island nation. I suspect they didn’t register a dot-ca domain because they’re not flavour of the month down at CIRA headquarters (assuming a connection, which is not much of a stretch), and might have had their domain suspended in short order had they registered a dot-ca. The footer of their website claims that they are “Internet Domain Name Services Inc.” — a name also used on the return envelope in which you’re supposed to send your cheque (or credit card number) and payment stub. Their contact page (when loaded from a computer in Canada) offers the same box number address in Toronto, Ontario, Canada that is on their notice (delivered to our Canadian address; more on that in a moment), which is located in Bridlewood Mall, where there is a Canada Post outlet hosted by Shoppers Drug Mart offering post office boxes. If you load their contact page from a computer located in the United States (or the United Kingdom, actually), the contact page offers a suite number address at 924 Bergen Avenue in Jersey City, New Jersey, United States of America. A quick check shows this to be a UPS Store, so the “suite number” is also actually a mail box number. On their contact page is an email address on the idnsinc.net domain, which is registered to the same company at the same box number in Jersey City in the US. First of all, the notice refers to ninernet.com, a secondary domain that we use but which is registered to our US address. However, it was sent to our primary Canadian address, which is also on the same contact page on our website as our US and Zambian addresses. As with the almost identical Domain Registry of Canada and Domain Registry of America phoney invoices, the “notice” from iDNS Canada makes reference to another “available” domain (in this case ninernet.BIZ) and invites us to send in payment to register it. However, ninernet.biz is not available; it has been registered by us since 2010. There is no indication on the notice what would happen to this extra money if we decided to send it in to register this additional unavailable domain. Finally, while similar such “notices” in the past have included fine print that authorises the sender to transfer the registration of the domain from under the management of the existing registrar to management by the sender of the so-called solicitation (a process referred to as “domain slamming“), this one doesn’t include any such fine print. In fact, there isn’t even any indication on the “notice” that sending money to iDNS Canada (aka Internet Domain Name Services Inc.) will obligate them to do anything, as they have no way to renew a domain that is not under their control! So don’t send them money, as you’re almost certainly sending money into a black hole from which you will likely see no service and from which you will probably be unable to retrieve it! As always, if you receive any kind of communication from a third-party (with whom you don’t already have an established and trusted relationship) about your domain — via postal mail, email, telephone, fax or even smoke signal — be suspicious, be wary. If you’re not sure whether or not it is legitimate, please contact us about it and we will be more than happy to take a look and advise you whether or not it is legitimate. 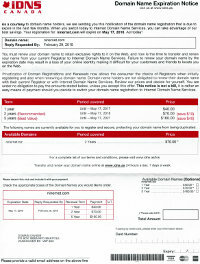 Once again we find it necessary to issue a warning about realistic-looking “invoices” for domain renewals. We brought this up in July last year, and the same company is attempting the same thing under a different name. What was called the “Internet Registry of Canada” is now attempting to scare you into renewing your domains with them under the name of “Domain Registry of Canada” (noted on the “invoice” as “a registered business style of 1446513 Ontario Limited”). The second major complaint was, as implied above, that these solicitations looked too much like an official invoice from an existing supplier, and that an unsuspecting employee or even business owner might pay the “invoice” resulting in unintended consequences (including your Web site and e-mail going down). This has not changed — the solicitations still look like invoices. Third was the strong language used, implying that you were in imminent jeopardy of losing your domain if you did not act immediately and send payment to the soliciting company. Again, this has not changed, although the language has been moderated slightly and, buried amongst the other promotional text, is a statement that the invoice-like solicitation “is not an invoice” but rather an “easy means of payment” should you be fooled. However, as with the previous scam, the “invoice” states that your “current domain name must be renewed” (emphasis is on the “invoice”). As before, one of the goals of these “invoices” is to get you to transfer your domain from your current registrar to the “Domain Registry of Canada”. Another goal is to convince you to needlessly register numerous variations of your domain, potentially quadrupling your annual domain fees. Space is provided for your credit card number should you choose to actually send such sensitive information to a company with such questionable business practices. Although this company is seeking to have you transfer your domain to them, the very fine print (requiring a magnifying glass and strong light to read) on the back of the “invoice” states that “you agree to provide written, signed authorization to DRoC for the transfer of the domain name to another registrar and agree to pay any and all fees that may be charged by DRoC to effect the transfer.” This policy is clearly designed to make it easy for you to transfer your domain to them from your current registrar, but very difficult to transfer back to your chosen registrar and away from “Domain Registry of Canada” once you realise that you have been scammed. Such a policy is known as “domain hijacking”, and there other examples of this unethical practice — please see the links at the bottom. This policy also goes against international agreements governed by the Internet Corporation for Assigned Names and Numbers (ICANN), to which “Domain Registry of Canada” is either directly or indirectly a party. A similar scheme was practised by some unscrupulous companies back when the long-distance telephone market was deregulated in both Canada and the United States. It had a very descriptive term — “slamming”. If I remember correctly, the process involved the victim endorsing a low-value cheque payable to the victim from the new long-distance company, with the fine print stating that you wished to switch from your current long-distance carrier to the new one. This practise was outlawed, but regulators have been playing catch-up with the Internet since day one. So how do you know if an invoice you received is genuine, and how do you find out when your domain really expires? Because domains are renewed on an annual (or longer) basis and we are all used to receiving monthly invoices to remind us to pay for services, it’s easy to forget the answers to both of those questions. It has even happened to Microsoft, believe it or not, when they forgot to renew microsoft.com. The best way to find out is to go to a reputable domain registrar, or the site of the single registration authority (from which registrars get their authority) for your top-level domain (TLD). In the case of Register.com, just use the form on their home page to check your domain. Since your domain is “taken” (by you, of course), you can click on the link on the page displaying the results of your search, and you will see a new page detailing (among other things) who your current registrar is and when your domain expires. If your domain really is about to expire, you can then go to your registrar’s home page and use their Web site to renew your domain. If all else fails, please contact us if you are not sure and we will decisively determine when your domain expires, who your registrar is, and who you should be paying. As an aside, NinerNet Communications recently started accepting domain registrations. While we still think that Register.com is one of the best registrars out there (and certainly far superior to the likes of Network Solutions / Verisign), we would be happy and honoured to accept new domain registrations, renewals and transfers. Since this is a new service, we don’t yet have an automated system in place. Please contact us for the details. Finally, here is a description of an official-looking “invoice” sent out by the “Domain Registry of Canada”. It arrives in a #10, plain, brown window envelope with a red maple leaf in the top, left-hand corner and the words “Domain Registry of Canada” to the right of the maple leaf. A similar layout is reproduced at the top of the actual “invoice”, which is printed on white paper using black and red ink. It refers to a domain that is probably registered to you and warns you that you risk “loss of your online identity” and that your “current domain name must be renewed” (emphasis is on the “invoice”). It then suggests several possible renewal periods for your existing domain (up to five years) and then suggests several other similar domains that you should register. Payment is accepted by cheque or credit card and is requested to be sent to a post office box in Thornhill, Ontario, Canada. A white return envelope (requiring postage) is included, completing the invoice-like package. Sorry this was so long, but we felt that this was important enough to warrant a full explanation. If you have any questions or concerns, please let us know. Comments Off on Phoney invoice alert!